Anti-Christmas Christmas Marketing: When do ads turn into fatigue? Brands whose businesses rely on gift-giving, by all means, have plenty of incentives to capitalise on Christmas/holiday seasons. In fact, some retailers even earn more during this time of the year than the rest combined. So it may seem only logical that such retailers start teasing their Christmas campaigns as early as October. But early Christmas ads will likely to tire out UK shoppers before the final rush in December, says the research by OMD UK. Ironically, the Christmas ads will only enjoy the peak of excitement in mid-November. End of the sappy, cheesy holiday commercials? While most retailers are talking about the same thing, some are beginning to ditch typical Christmas newsletter and pictures of Santa in their marketing strategies, offering an alternative messages to their customers instead. They’re well aware of what Christmas means to their loyal customers, finding the common ground between their branding and the holiday vibe. Here is a handful of brands who have opted out cliche and created alternative takes on Christmas instead. Harvey Nichols tops the list of anti-Christma Christmas marketing with its witty and minimalist campaigns of 2013. Christmas is not about being socially pressured to buy something expensive for friends and family. Yet, the consequence of not buying anything will result in the guilty feeling that will haunt you. The actual cheap products featured in the ad were sold out in less than 3 days. A typical example of ‘less is more’ principle. But Harvey Nicoles is not the only one making fun of the excesses of gift-giving habits. Honda’s TV ads back in 2011 featuring Patrick Warbuto were seen as the “new breed of holiday advertising”. Happy Honda Days “Elves” from Drive Thru on Vimeo. “Best of Times” from Josh Hill on Vimeo. “And this great “Happy Honda Days” ad series […] is right up his alley—calling on him to be quietly dismissive of all the holiday hoopla while still making a holiday pitch. He can get away with this, partly because he acknowledges the hypocrisy and partly because he’s just flat-out likable.”, says AdWeek. Here is another one embracing the same angle with a whole different tone of voice. Put it simply, who cares about everyone else, gift yourself. Some may like this friendly Ukrainian folk, others may not. Yet, this might be one of the less consumerist commercials we can find in today’s oversaturated pool of overly cheerful Christmas ads. Speaking of overly merry holiday vibe, Canon hints an alternative called ‘Come and See’ campaign with its quiet yet powerful ad that contradicts the noise of Christmas. Then we’ve got a ‘less selfish approach to holiday shopping’ that is simply and bravely went against the whole concept of “Christmas consumption”. 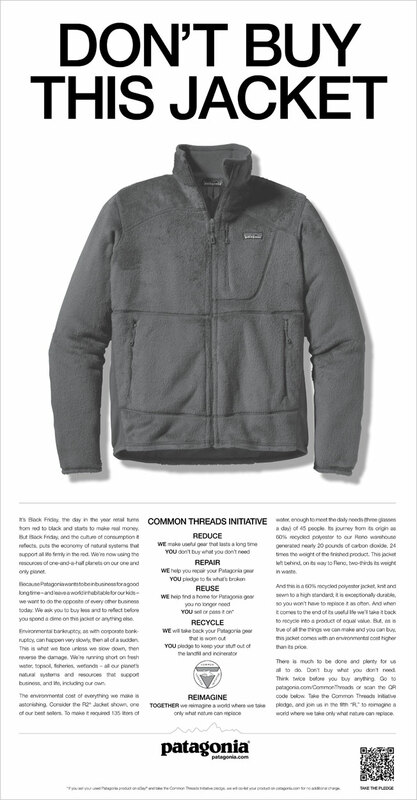 Patagonia’s bold Christmas in 2011 is one of my favourites of all time: the real anti-marketing marketing scenario. Despite its sales success prior to this, the brand entirely opted for pure anti-Black Friday and anti-Christmas campaign with straightforward ads: Don’t buy our Jacket. And what’s more striking is its following massages where it admits its failure to their jackets are no good to the environment. A corporation simply trying to live its company promise? Or can it be read as a hypocrisy? Not many brands risk their short-term holiday sales on the basis of green appeals. Today Patagonia hasn’t dropped its commitment to environment. REI (another outdoor brand!) has opted out for the Black Friday this year by completely shutting their stores that day, showcasing another unique example of anti-Christmas/anti-BlackFriday marketing. Don’t be fooled by the pre-Christmas sales frenzy where most brands basically want you to dump your money on stuff you don’t even need. Just like Patagonia, the bottom line is that these two do need to sell. But they don’t want to take the mainstream tactic. When every brand is doing something very similar in the wake of holiday seasons, they tend to bore their customers. As we’ve seen here, big brands have started opting for a different approach. Some are even bolder to go for strong “anti-Christmas” marketing strategy. What Patagonia and REI are doing will less likely to alienate their customers. In contrast, they are redefining who they are, what their brands stand for, and ergo, what their consumers stand for. And guess what? Consumers do appreciate honesty and authenticity.